Mystery author Matt Ferraz joins me today to chat about his new cozy, The Convenient Cadaver. Author of all trades, Matt Ferraz has written thrillers, sci-fi, cozy mysteries and a lot of witty e-mails that sadly can't be published. With a degree in journalism and a masters in biography, Matt has works published in English, Italian and Portuguese, and loves trying out new genres. 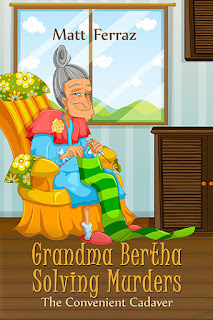 The Convenient Cadaver is the first volume of my new series, Grandma Bertha Solving Murders. I always wanted to have an old person as a main character in one of my novels, and the structure of the cozy mystery seemed perfect for that. My protagonist, Grandma Bertha, is an old lady who lives in a small shed in the backyard of her son's house. In the eyes of her family, especially her daughter-in-law, Grandma Bertha has done everything she had to do in this life, and now needs to rest and wait for her time to come. But there are many things this old lady still wants to do with her life, and when a girl appears near her house with three bullets on her back, Grandma Bertha decides she's going to find out who the killer is before the police. Grandma Bertha was based in three people. Two of them are my grandmothers, and the other one is my late friend Silvia. There's a little bit of each one in Grandma Bertha, and the book is dedicated to them. Right now I'm working in two books. One is a LitRPG novel which I'm co-writing with another author. We hope this one gets released around October. The other book is the second volume of Grandma Bertha Solving Murders, which will be a short story collection, each one a different case for Grandma Bertha to solve. I write short stories ever since I learned how to read and write, but I started thinking of myself as an author when I was six and my mother let me have her old typewriter, from when she worked as a secretary back in the 1980's. Now I had an instrument to write, which must mean I was a real writer. I still have that typewriter, it's one of my biggest treasures. I just finished my Masters in the UK, and now I'm back on my home country Brazil, teaching English to Brazilian children. I have serious plans of becoming a full-time writer, and I think I'll be able to reach that goal in a year or so. I suffer from methyphobia: an irrational fear of drinking alcohol, which means I'm completely clueless when one of my characters wants to have a drink. My friends usually give me some tips in these situations, especially about which drink is more suitable to the character's personality. A writer. Always. Sure, like any other kid I wanted to be an astronaut once, but that never sounded as exciting as being a writer. I'm a very funny guy, and that shows in my books. I guarantee that you'll have some good laughs. Thanks for being here today, Matt!